We started off our Halloween with Back to the Future with a friggin' symphony playing the soundtrack at Powell Hall! A lot of people were pretty jealous of my rockin' orange vest. One of the movie's two writers, Bob Gale, gave a fun little introduction before the movie. Apparently he's from St. Louis County's University City. He said he got the idea for the movie by looking through his dad's high school yearbooks and wondering if they would be friends if they met at the same age. Very cool. I couldn't think of anything really cool to be this year so I just phoned it in and got this dinosaur snuggie thing that I thought looked cool. Numerous people came up to me and yelled "Reptar! ", a character from Rugrats so I just went with it. 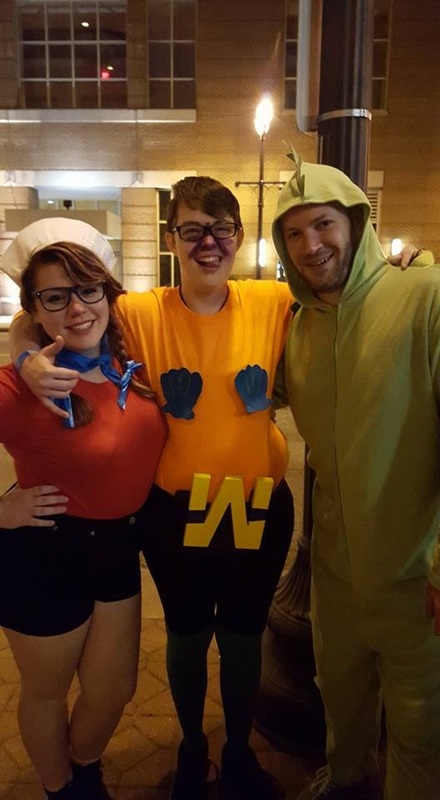 I bumped into some fellow Nickelodeon characters who I thought looked pretty solid: Spongebob's Mermaid Man and Barnacle Boy. We joined the Star Clipper Zombie Pub Crawl this year and it was a lot of fun. Unexpectedly I think the most entertaining part of it was getting all zombied up at the apartment. We got some clothes from Goodwill and tore them to shreds. I mixed fake blood, some kind of latex stuff, and a wad of newspaper together and slapped it on my forehead to make it look like I had some head trauma. It was especially amusing bouncing around Washington Avenue's bars because since Halloween is still a week away most people out weren't dressed up so we were especially weird. I freaked several people out who just saw me out of corner of their eye. I rocked someone especially well in our building's elevator. We were out at Target looking for Halloween costumes when we spotted the Weinermobile! Of course I had to do some research. There are currently 8 active Weinermobiles, and their drivers are called Hotdoggers. Wikipedia says that it features a horn that plays the Wiener Jingle in 21 different genres from Cajun to Rap to Bossa Nova. I'm sort of regretting that we didn't stick around to hear that. St. Louis is home to the Federal Reserve Bank of St. Louis which serves bits and pieces of multiple states, covering cities like Memphis, Little Rock, and Louisville. Missouri is the only state that has two Fed Banks, the other one is in Kansas City. So I've walked past the place a hundred times and always kind of wondered what it was like in there. The building itself looks pretty awesome from the outside at least. So when I saw signs for the new Inside the Economy Museum, you know I had to go. The place has normal business hours so I had to wait for a day when Lydia would be home from work early. Just getting into the place was pretty notable. It's very fancy inside, with pretty much every surface being marble, and lots of fancy metal work around doors. It also had a serious amount of security. We had to go through airport style metal detectors, wear ID badges, have our drivers licenses scanned, and there was even a canine unit walking through the actual museum while we were checking it out. There must be some serious money in that place somewhere. The museum started off with a very impressive room featuring this crazy laser lightshow-esque extravaganza. It was definitely among my top 5 favorite economics themed lightshows. Lydia beat me at this commodity trading simulator game. Suspicious, I know. This reminded me of a drug movie. The place was a lot more interesting than I expected it would be. The place had very high production values and did a really good job of explaining how different aspects of the economy work. My favorite was this cool video with a graph of every country's income plotted against their life expectancy, then all the dots flowed up and down with time since like the 1800s or something. World wars would send all the dots plummeting only to bounce right back up, and some countries got their act together and moved up and others didn't. It was really cool. This is what a million in one dollar bills looks like apparently. There was a giftshop and they were giving away free bags of shredded money! I figure I can round up a few bags of this and buy some tape, and Lydia's students can do a fun art project for me. The whole thing was really cool. My theory on why the museum exists is that it's a public outreach program to counter the "audit the Fed" and similar political grumblings against the Federal Reserve system in general. We attempted a repeat of the good times from last year's Hermann Oktoberfest and I'd say we nailed it. We started off with a nice German lunch at Hermann, MO's flagship Stone Hill Winery. I dove into the German spirit with the "GERMAN SPECIALTY PLATE: a perfect sampling size of our Sauerbraten, Schnitzel, and Knackwurst served with red cabbage and potato pancake." After lunch disaster struck. We headed over to the tasting rooms, and the wine tasting was no longer free! I was like "What the F!" and I immediately turned over a table with disgust in my passive aggressive imagination. Apparently last year a group of sneaky yet dashingly charming rogues went around free-tasting the same wines over and over and then never bought anything. Legend has it that their leader, Johnny Winolito, was never brought to justice. So we "picked out a few bottles in the store" and "stood in line" then "traded money for products" like boring normal people. A couple of Lydia's work friends, and a couple of their friends were in attendance.